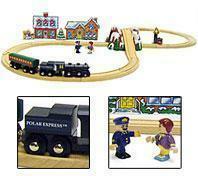 Recreate the magic of the Polar Express with this authentically styled wooden holiday set. Designed in a figure 8 layout, the train picks up the boy from his home and takes him on a journey to the North Pole. Go over and through the mountain tunnel and hear the bell sound as the train passes the signal. Features a wooden train consisting of the engine, tender and passenger car. Also includes play homes and poseable boy and conductor figures! 28 play pieces. Layout dimensions: 44" x 20". For ages 3 to 7.